Branded water bottles have long been a go-to for diverse companies looking to make an everyday statement. Not only are these premiums universal – who doesn’t love an easy-to-carry bottle that keeps drinks cool? – but they’re affordable, durable and leave a lasting impression on the recipient and everyone who spots them sporting their branded bottle. But that is just the beginning. More recently, the category has had a serious moment – thanks to a rise in high-end water bottles. Instagram and the boom in wellness culture has pushed brands like S’well® into the spotlight, making luxury water bottles a must-have among trendsetters, tastemakers and everyday sippers alike. 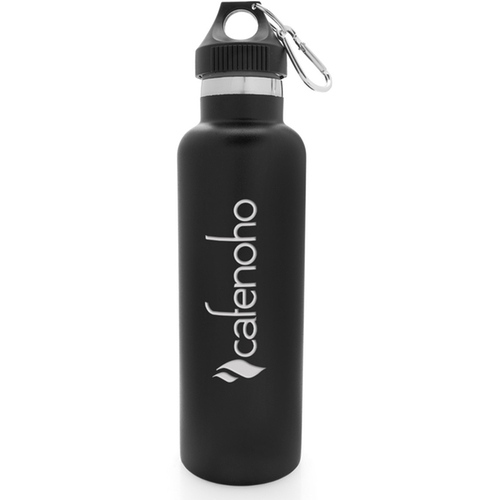 Now a true accessory with major cache, your clients are, no doubt, investing in – or, simply, coveting – premium water bottles. And that opens up an even bigger opportunity for your brand. Your job, then? Take a page from the premium water bottle playbook and brand your own collection of Insta-worthy pieces. Again, these bottles are incredibly useful, incredibly durable and designed to go the distance – that means long-lasting branding that’s constantly on display, as bottles adorn customers’ desks, locker rooms, cars and conference rooms. Not only that, but you’ll be giving a nod to your the greater good – specifically, the environment. Every time your client fills up, they’re skipping paper or plastic cups – and that adds up to a major landfill reduction over time. All in all, it’s a great message for your brand. By simply being associated with this must-have item, you’ll create increased awareness and more positivity – and that’s powerful. And that brand ripple effect doesn’t just stop with the recipient and the people they encounter mid-sip. Given the popularity of luxury water bottles, there’s a good chance your stylish premium will make its way to social media, generating even more attention – and more engagement for your brand. To maximize sharing, consider adding a note asking recipients to tag your brand on Facebook or Instagram, for a chance to win another unique premium. Given the popularity of these bottles, that added exposure could translate to significant earned media. Your clients are, no doubt, constantly on the move – and they need a premium water bottle that keeps up. For most, that means an insulated bottle that keeps drinks cooler, longer. Many insulated bottles are, also, stainless steel. Given their finish, these bottles have a sleek, chic appearance that makes them easy to carry, easy to slip into a bag and easy to drink from, even on the move – they’re also incredibly durable. Better still, because these bottles are so on-trend, your customers will no doubt want to show theirs off, and that will likely mean added eyeballs and added engagement. Some of the top brands in the market are putting their names, logos and messaging on premium water bottles. Take advantage of this major trend wave by promoting your business with these bottles. Glass water bottles inherently look and feel high end because of their delicate nature. Also, because glass doesn’t absorb taste or odor, these bottles tend to look and feel cleaner and fresher longer. Our pick, all bottles considered? April’s Product of the Month: this Stainless Vacuum Tumbler. 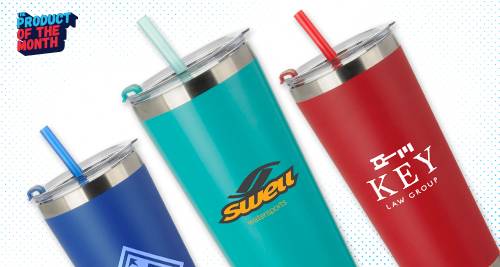 Available in five colors including a fun and on-trend teal, this 20-ounce tumbler is made of 18/8 stainless steel with a powder coated finish and dual wall vacuum seal construction. And, with a flip-top lid and straw, it’s easy for your customers to sip anywhere, anytime. To us, this one’s the best of the bunch, combining premium branding real estate with the benefits of an insulated bottle and sleekness of stainless steel. Best of all, this tumbler is on sale and starts at just $7.99 per piece. Get in touch to learn more about April’s Product of the Month and other premium water bottle options.